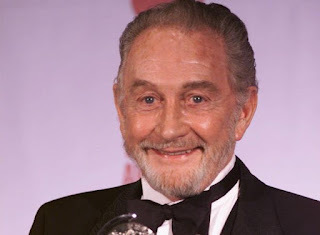 Beloved British character actor Roy Dotrice passed away yesterday, October 16, 2017. He had numerous supporting roles in film and television, with 120 listed acting credits on the IMDb. Having been born shortly after World War I ended in 1923, Roy and his family were displaced by the Germans in War War II, prompting him to lie about his age and join the British Royal Air Force as a precocious lad of just 16 years. Roy Dotrice's plane was shot down in 1942, and he remained a German Prisoner of War (P.O.W.) for the remaining three years of the war. In fact, he first became an actor to help entertain his fellow Allied prisoners in mini-productions he participated in to help boost morale. You cannot help but love him for that. His was labeled the "greatest generation" for a reason. 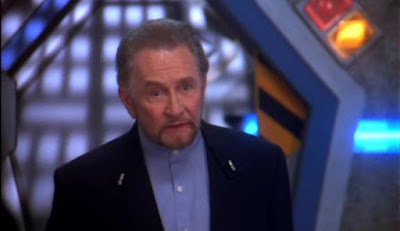 Roy Dotrice notably played Leopold Mozart in Amadeus (1984), Father Wells in Beauty and the Beast (1987-90), the sage Russian figure skating coach Anton Pamchenko in the classic rom-com The Cutting Edge (1992), the cowardly, Neville Chamberlain-like Centauri-appeasing Earth Ambassador Frederick Lantz in Babylon 5 (1993-98), Wesley's judgmental father Roger Wyndam-Pryce in Angel (1999-2004), the one-armed Elf King Balor in Hellboy II: The Golden Army (2008), and his final screen role was the memorable Hallyne the Pyromancer in Game of Thrones (2011-18). And Roy even narrated the award-winning A Song of Ice and Fire novels on audiobook from Book 1: A Game of Thrones to Book 5: A Dance of Dragons. Unfortunately, he will not have the opportunity to complete his narration narrate the final two planned novels in George R.R. Martin's series, Book 6: The Winds of Winter and Book 7: A Dream of Spring. Just a month before his passing, Roy Dotrice left the above video message for his Beauty and Beast fans, which is also acts as a fitting farewell from the actor, in retrospect. It is a little bittersweet to watch, but it is touching how close he remained to his fans even at 94 years of age.